Got turned onto this band because of my May 2011 of Trans-Siberian Orchestra review where I noted the amazing vocal talents of Andrew Ross and after seeing my review, the band contacted me and was extremely nice in hooking me up with a copy of Out of the Sun. It’s such a phenomenal release, I’m surprised I wasn’t aware of it beforehand! Again, Ross absolutely shines throughout the whole album. It’s good to know he sounds good as good live as he does on record and let’s not forget about the guitars! Some really great work is being put in by Aurelien Budynek and Angus Clark (also tours with TSO, so you already know he’s a great guitar player). There are some really smokin’ solos and great riffs all throughout this disc. The really cool thing about the album is that while it’s all metal, there’s a few different styles. “Out of the Sun” is a fiery opening number and displays that Iron Maiden is obviously an influence on this band and that’s readily apparent on others numbers too thanks to the twin guitar attack (“Forgotten Son”, “Streets of Montmarte”). The boogie of “Back Lounge” sounds like something that could’ve come from one of the Sunset Strip bands. “Chronicles of Sorrow Pt. 1” displays a progressive side to the band while “Lillian” sounds like an unreleased Thin Lizzy track (“Hero Falls” sounds a bit like Lizzy too) and closes the album on a fun, infectious note. Maiden, power metal, progressive, Lizzy and a bit of classic rock all combine to make Out of the Sun one heck of an album. Not a single filler track to be found. 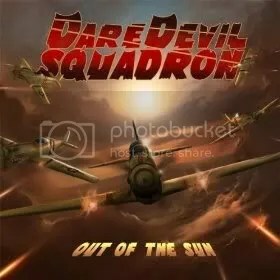 DareDevil Squadron has got to be one of the best metal bands I have heard in sometime. All around high-quality players, Ross’ singing is just off the charts and they’re writing great songs. People really need to seek this band and album out. Definitely one of the best albums that came out last year.